Isla Morley is a native South African residing in Los Angeles. Her debut novel Come Sunday won the Janet Heidinger Kafka Prize for fiction in 2009 and was a finalist for the Commonwealth Prize. Above is a sophomore effort worth applauding. Blythe Hallowell is 16. Her life is not unlike any other teenage girl’s growing up in the Midwest. She enjoys school, flirts with boys, and loves her family. Eudora, Kansas, her hometown, is quiet, blissful, and at times downright boring. Blythe’s world, however, quickly becomes anything but when she’s abducted by a crazed survivalist. Her once idyllic life is suddenly reduced to one room, hundreds of feet below ground in an abandoned missile silo. The girl’s captor, a man named Dobbs, is convinced the world is about to end. He formulates a plan wherein he and the girl will be safe, and once the holocaust has ended, the two of them will begin to repopulate the world. Sensing that total destruction will occur, Dobbs treats the silo like Noah’s Ark, collecting every bit of history he can. He squirrels away documents like the Constitution and artifacts such as tools and appliances. All the while, Blythe schemes and attempts to escape the man’s clutches, but to no avail. She finally resigns herself to her fate and years pass without Blythe ever seeing natural light or having any connection with the world she once knew. Her captivity takes its toll on her health, but that does not dissuade Dobbs from carrying out his plan to carry on the human race. Blythe eventually gives birth to a son, Adam. The story unfolds with Blythe teaching her child about the real world through books and stories. The author hooks the reader early on, her passionate writing allowing us to feel the fear and desperation Blythe experiences. The kidnapped girl’s sadness is palpable once she realizes she will most likely spend her remaining days underground, never to see her family again. Moreover, her son may never experience what she did Above. Nevertheless, her dream of one day allowing her son to experience what’s Above never dies, and one day Blythe capitalizes on Dobbs’s inattention. The pair escape, but to Blythe’s horror Above is not as she left it. A nuclear disaster has changed the climate and the environment. People are scarce, and those that the woman and her son encounter are horribly deformed and bent on destruction. No government exists and bands of vigilantes wander the countryside. 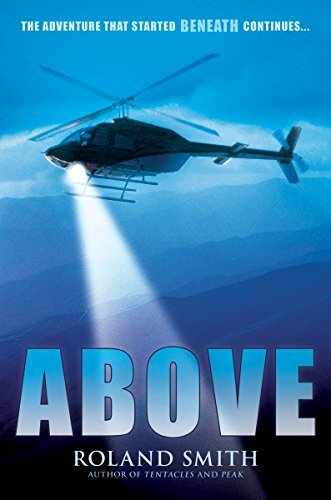 Above is a scary tale for many reasons. The thought of a young girl held captive, subject to the whims and desires of a lunatic is itself frightful. And the concept of nuclear disaster is not only scary, but also not so farfetched. Morley’s writing is magnetic, instantly attaching the reader to the story. We see, we feel, and we cringe at the victim’s circumstances. Most of the book is depressing, but that doesn’t make it bad. On the contrary, the author has produced a pragmatic picture of what could very well occur some day in our future.